COMPASSIONATE CLIMATE ACTION: Permaculture to the Rescue! 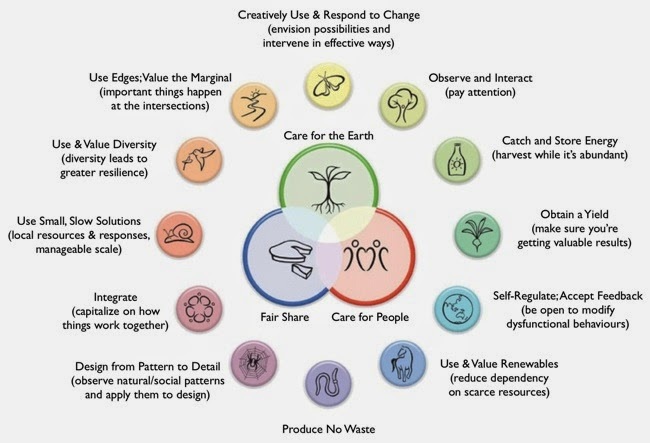 I'm already into the fourth week and the fourth lesson of the online permaculture design certificate course I'm taking with Geoff Lawton and his team in Australia (see this intro to Geoff). I've gotta tell you, it sure is exciting learning! But more important than the landscaping "eye" I'm developing is the ecological learning I'm doing. For example, there's a whole section just on patterns in the natural world. It's the patterns that capture energy for living systems, and it's vital that we harmonize with patterns rather than working against them. Things got really out of whack in this culture when we started working against the rest of Nature: growing monocrops in straight lines with no diversity, with no features for trapping and recycling nutrients, with no water features. Topsoil was either lost or depleted of nutrients. So farmers had to start using chemical inputs, which has led to even less diversity of life in soils and on farms generally. This course teaches that soil degradation is at the core of the environmental problems we're facing. Permaculture is about partnering with ecosystems and designing for ecosystem interactions that will build soil. Looking at what's happening in California right now is chilling, knowing how much of western Canada's food comes from there. One hundred percent of the state is in drought of some kind (and it's only April, close to two months away from summer), with nearly 25% of California in exceptional drought. The most important element in permaculture is water, and permacultured landscapes are focused first and foremost on water retention. Imagine the resilience in the face of climate disruption that would come from food growing that is based in and on natural systems (which we help along) that have many connections, that are rich in diversity, and that waste nothing because everything is cycled through the system. Imagine! If you are ever feeling totally blue about the state of this planet, I won't blame you for going the way of Paul Kingsnorth and Will Falk (I often go there myself). But if you want to try out something different, look up permaculture. Watch Geoff Lawton's videos on it or check out the old videos by permaculture founder Bill Mollison. Read a book on it (try Gaia's Garden by Toby Hemenway, or a book by co-originator of the movement, David Holmgren). Take a course in it. It will definitely cheer you up for a while, by the sheer sense of possibility and opportunity it will give you. p.s. I am grateful to permacultureprinciples.com for the wonderful image above.